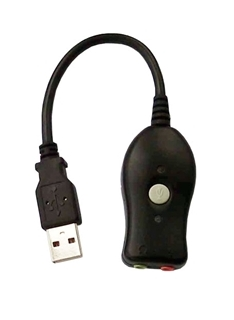 Buddy USB 7G Sound Pod is our seventh-generation USB adapter with a built-in high-quality sound card that replaces a desktop or laptop computer’s sound card for high performance speech sound input and output. Buddy USB 7G Sound Pod features our our new and highly effective, real-time adaptive, noise-cancellation DSP technology FilteredAudio. FilteredAudio technology is capable of cancelling heavy machinery noise and other ambiance noises such as air conditioner that can effect the accuracy of dictation. Specialized electronics provide filters for noise cancellation (including DC component, high-pass, and low-pass filters) to restrict the audio signal within the usable range as required by speech engines. Higher frequencies than those which can be used by these engines are normally counterproductive. There is no additional software to install -- all required drivers are already present in current versions of Windows XP, Vista, Windows 7, Mac, and Linux operating systems. All audio filters, DSP, and configuration are stored within the device itself. The use of noise-cancellation electronics yields extremely high recognition accuracy (in the high nineties) with Dragon NaturallySpeaking. The Buddy USB 7G Sound Pod includes a push button and indicator lights. Although the lights are set by default to show power status and microphone mute status, all dynamic features ( button, lights, and noise-cancellation algorithms) are customizable using our free downloadable support software, MyBuddyMic. For example, the button can be customized to behave as a Push-To-Talk button or Mute toggle, and can even control a Dragon NaturallySpeaking microphone directly. Additionally, the button can perform three different operations depending on how it is pressed (i.e. Click, Double-Click and Hold). Each one of these operations is mutually exclusive. Similarly, the lights can be reprogrammed to indicate whatever state might be of interest to the user. Connectors on the Buddy USB 7G Sound Pod conform to PC-99 standards and accept 3.5 mm (1/8”) stereo audio connectors. A green LED light near the cable is programmed by default to indicate power and operational readiness. Another RGB LED near the connectors is programmed by default to display microphone mute status. The push button is programmed by default to mute the microphone when attached to the microphone connector. ExpressCard technology is designed to deliver high-performance, modular expansion for both desktop and notebook computers at a lower cost and in a smaller form factor.